History of Football Games. Football history began in the 2nd century BC and -3 in China. In the Han Dynasty, the skin dribbled into the net with a little kick. A similar game played in Japan with the title over here. In Italy, the game kicking and carrying the ball is also popular, especially from the 16th century. Modern football began to flourish in England and became very popular. In some competitions, the game is causing a lot of violence during the match so that the end of King Edward III banned the sport played in 1365. King James I of Scotland also supports the ban to play football. 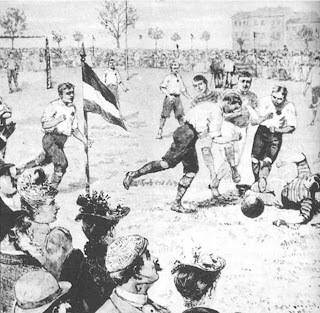 In 1815, a major development led to the famous football in college and the school environment. The birth of modern football in Freemasons Tavern in 1863 when 11 schools and clubs get together and formulate a set of rules for the game. At the same time, there was a clear separation between sports rugby football (soccer). In 1869, carrying the ball with his hands began banned in football. During the 1800s, the sport was brought in by sailors, merchants, and British troops to various parts of the world. In 1904, world football's highest association (FIFA) was formed and in the early 1900s, the various competitions played in different countries.